My basil plants are growing like crazy this year! I think I have basil bushes, and I am not complaining, I LOVE basil!! But, I can’t use it fast enough. 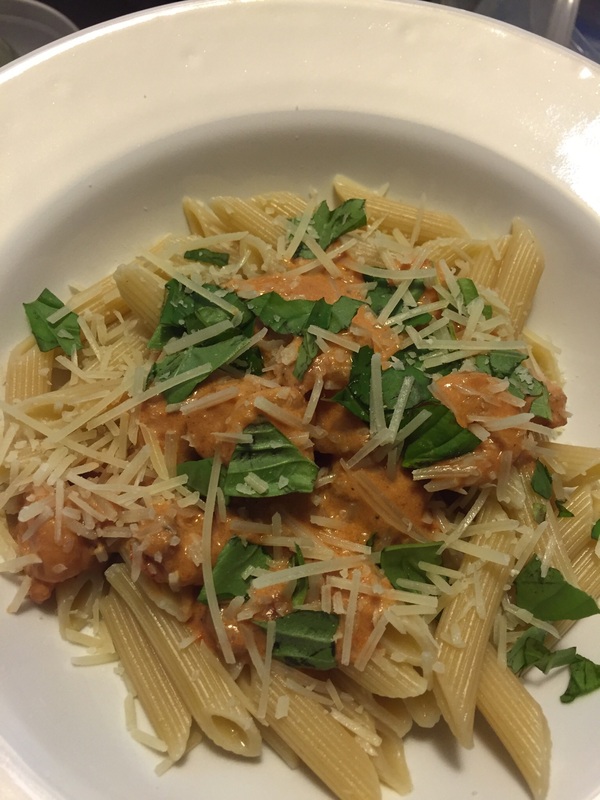 I made this tomato basil sauce a few times already. So yummy! 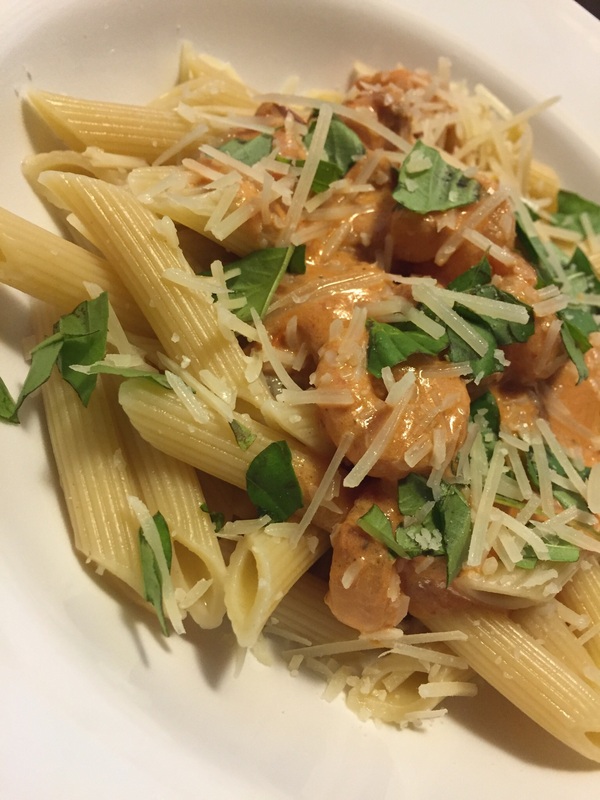 It’s a thick pink sauce and works best on a penne, you can use whatever pasta you have on hand but when I make a thick sauce like this, I bring out the penne! This recipe makes 2 servings. Since I made this for just myself I plenty of leftovers. It’s a pretty easy and basic recipe, easy to increase for more servings. If you don’t care for the sauce being thick, substitute tomato sauce for tomato paste. You really cannot mess this up! My store had frozen shrimp on sale, cooked, shelled and deveined, so that’s what I used this time. You can use whatever you want or have on hand, just make sure you cook the shrimp first before you make the sauce. The first time I made this, I used raw shrimp, so I started with a little olive oil in the pan and sautéed the shrimp until done. To the cooked shrimp, add the tomato paste, half and half, and chopped sundried tomatoes, stirring to blend together and heat through. If the sauce is a little too thick, add a little bit of the pasta water. Toss in the torn basil and serve. Top with shredded parmesan and more torn basil. Start your pasta, when the pasta is almost cooked, start your sauce. If using raw shrimp, sauté in olive oil until cooked. 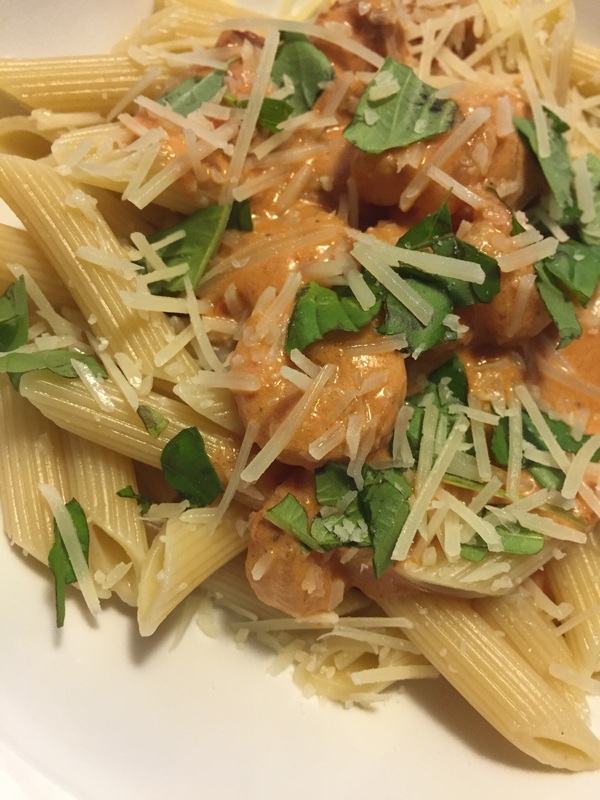 Add all of the above ingredients to the shrimp, except the basil. After the sauce has combined and is heated through, tear up about 10 basil leaves and add to the sauce. Drain the pasta, place in 2 serving bowls and spoon the sauce over the pasta. Top with remaining basil leaves and cheese. Follow me on Facebook for more random babbling. Live well friends!